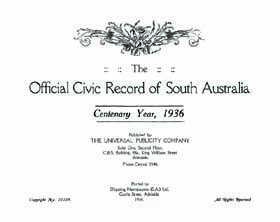 The Civic Record of South Australia was published in 1936, South Australia’s centenary year. This volume provides a wealth of information about the history of Adelaide and the development of councils throughout the surrounding suburbs and country districts of South Australia. It provides a history of Colonel Light the first Surveyor General of the state, a section containing information on the Governors of South Australia and the Mayors of Adelaide, and a history of South Australia beginning in 1836. A major section of this volume contains the histories and details of the development of district councils and corporations of cities, suburbs and districts throughout the state. Included in these descriptions are lists of names of past and present councillors. Some have further information. This is a great genealogy resource for anyone exploring their South Australian family history or building a family tree.